The proximity of the cottage to the beach made it feel like an exclusive private area just for us! 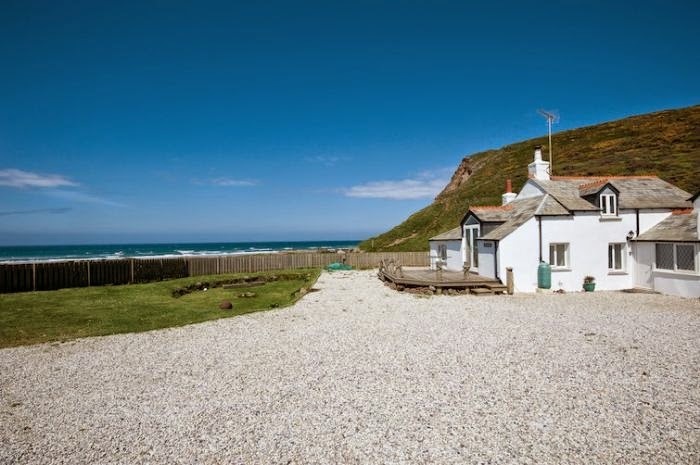 Naturally with us visiting in November meant there were very few people about at Northcott Mouth which itself is beautiful, offering pleasant walks either way up the cliffs along the coastal path or when the tide is out, on the beach. At high tide the sea was less than 30m away from the cottage and we experienced heavy weather one dusk which lead to amazing views of the storm swell, thunderous waves and sea spray being whipped up. Sitting behind the comfortable double glazing with very thick stone walls and the log burner blazing away we felt safe, warm and privileged to be this close to nature. With shopping facilities in Bude being less than 5 minutes away, all the essentially were on hand easily. As for sight-seeing places like Clovelly and Tintagel, Port Issac, Boscastle and Padstow were all within easy strike. Even Bodmin Jail and the infamous Jamaica Inn are all within a half day trip reach. I expected charm which it delivered admirably, but I was not prepared for the quirkiness! 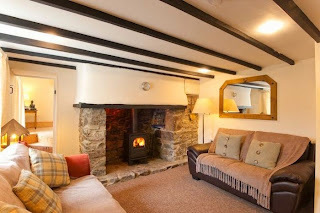 The owners have created an amazingly workable, comfortable and cosy holiday let that does not feel claustrophobic, but warm and inviting. The lounge area with its log burner was great for the dark evenings to settle down to chat about the day's events and watch movies! The kitchen was well provisioned with 2 fridges, a freezer, microwave, toaster, dish washer and cooker / hob everything is on hand. The dining area and front sitting room face out onto a large decking area and onto the beach which is simply delightful to watch the sunrise / sunset whilst eating either indoors or out. The downstairs double bedroom had a small shower and toilet room next to it providing near en-suite facilities. A lot of the internal doors are low height and with me being 6 foot had to be aware! Some of the doors and stairs leading up to the bedroom are narrower than normal which takes a little adjustment also. However these features and the fact the ground floor seems to be on about 3 levels all adds to the quirkiness which we loved. I would not take someone who is infirm or has mobility issues, or someone who expects 5 star hotel luxury because the property does have to contend with the direct effects of its location to sea and salt. The oil boiler pumped out hot water better than my own house and the central heating worked extremely well, so we were never cold or left waiting for 4 adults to get through our daily routines! I would stay here again (we were two couples on a 5 day break leaving the kids at home!) and recommend others to do so, especially out of the high season if you wanted a quaint and peaceful get away because although it appears isolated (we hardly saw anyone else around), everything is available and nearby. 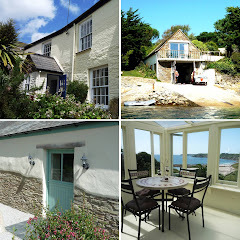 In our opinion it offered the best of both worlds - a little escapism where we could get away from everything at night, whilst lunching out in some amazing North Cornish villages. It is warm, well provisioned, comfortable and the location is unbelievable." Many many thanks to Mr Chatwin for the excellent review, we hope you get to return to The Nook soon. 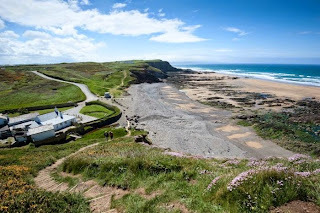 If you would like to visit The Nook at Northcott beach near Bude, click this link to be directed to the website. Remember until the 24th December 2014 a 5% discount is applied to all bookings in 2015. For a full list of all our cottages visit www.CornwallsCottages.co.uk.